Didn’t you love those dreamsicle ice cream bars when you were a kid! We were visiting our new grandson, Oliver, in Chicago a couple of weeks ago. He’s now 3 months old and boy, how time flies. Seems like it was just yesterday that we went up to Chicago to meet the new Michie baby boy. And, it seems like just yesterday I was a little kid eating cho cho ice cream malt cups and those dreamy dreamsicle ice cream bars. 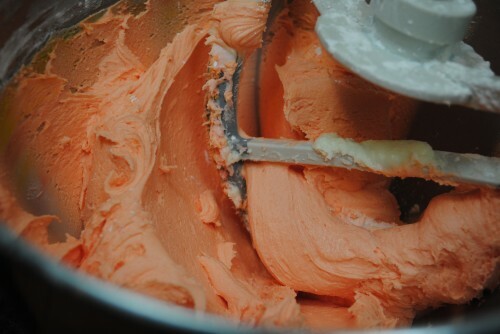 I love mixing orange sherbet and vanilla ice cream together in a parfait class because it reminds me of dreamsicles that use to drip down my arm on those hot summer days in Missouri and I still love that flavor of orange and vanilla mixed together. There’s a bakery in Lincoln Park (Chicago), Sweet Mandy B’s, that has the best baked items ever, and we went there after lunch at Longman & Eagle one day. Of course, we had to come home with some molasses frosted cookies that my son loves and some 7 layer bars, chocolate cookies, a macaroon and this wonderful little Dreamsicle Cupcake. I was staring at this lone beautiful cupcake sitting in the box along with all the other cookies and really wanted to gobble it up all by myself. 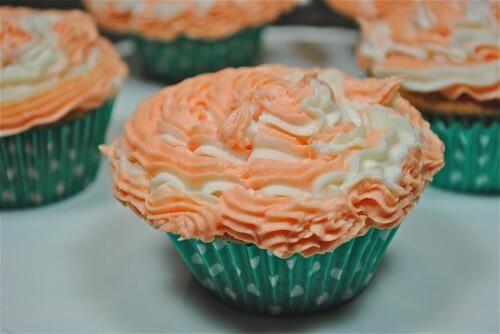 After all, I was the one thinking of dreamsicles and having all these childhood memories, but I shared the cupcake because I wanted everyone else to see how delicious it was. I KNEW I could make this cupcake. For the frosting I used my mother’s Whipped Cream Frosting and put both orange frosting and the Whipped Cream Frosting in a bag and piped it onto the cupcake to give it a swirled vanilla/orange look and taste just like that Dreamsicle ice cream bar I so fondly remembered. On some of the cupcakes I piped some of my mother’s whipped cream frosting into the center of the cupcake using a pastry and then frosted using a pastry bag fitted with a star tip. 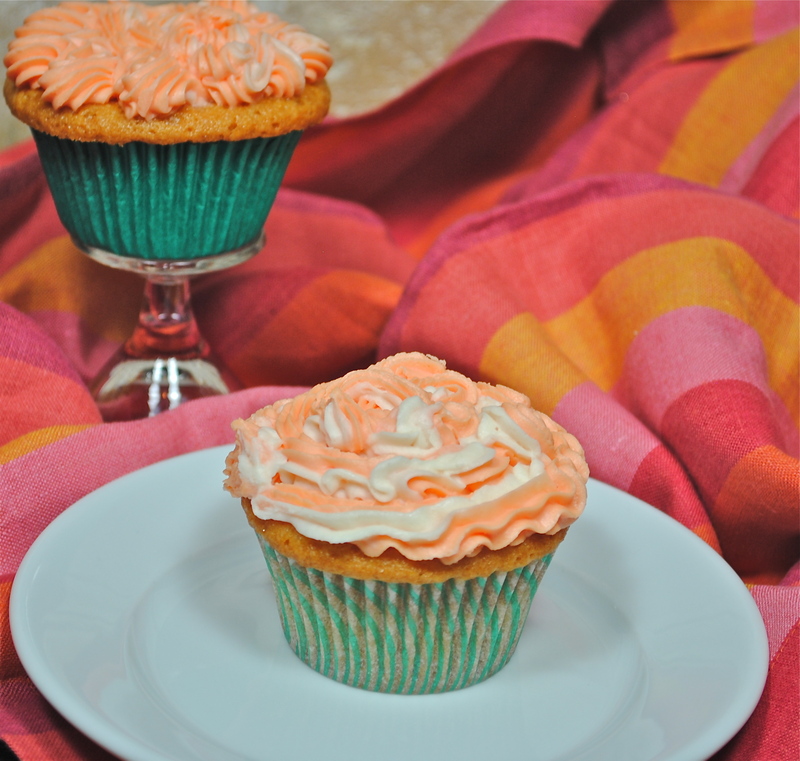 I hope you will try these cupcakes and I hope if you ever loved Dreamsicle ice cream bars that these will bring back fond memories of your past. Just yummy ingredients. The better the orange, the better the flavor. The oranges went into blender to make the juice. I used the orange rind and made some candied orange peel. Sugar, eggs, milk and orange juice. 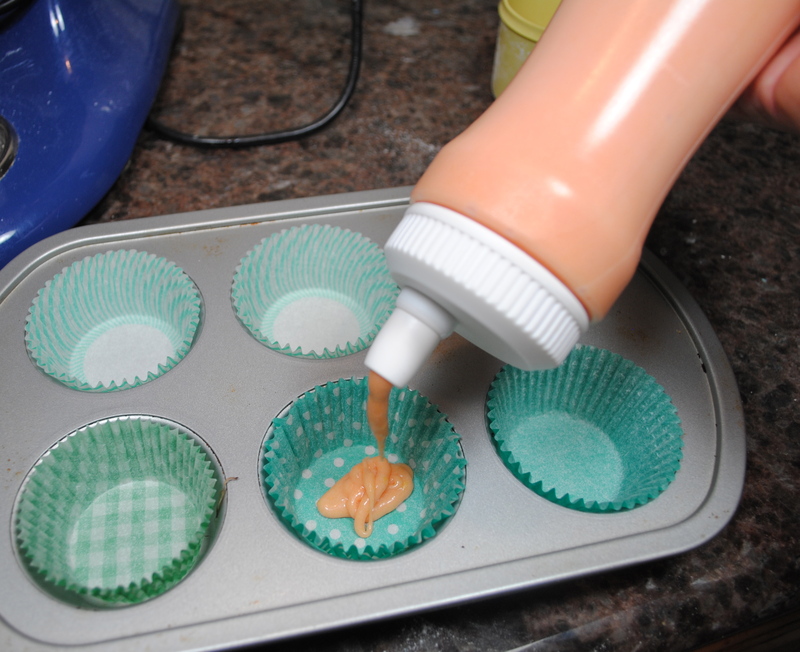 I used a Williams Sonoma liquid food color to get this beautiful shade of orange. This container is used to fill pancake molds but it works great for putting batter into cupcake pans. No mess! Bake until puffed and toothpick inserted in center comes out clean. Good enough to lick out of the bowl. 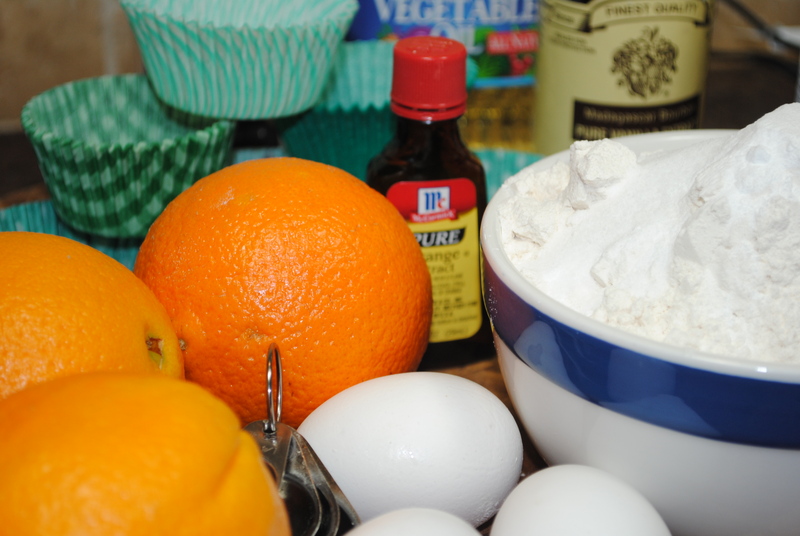 See index for the Whipped Cream Frosting recipe. Pipe some of the whipped cream frosting into center of cupcake. Preheat the oven to 350 degrees F. In a small bowl, whisk together the flour, baking powder, baking soda, and salt. Set aside. 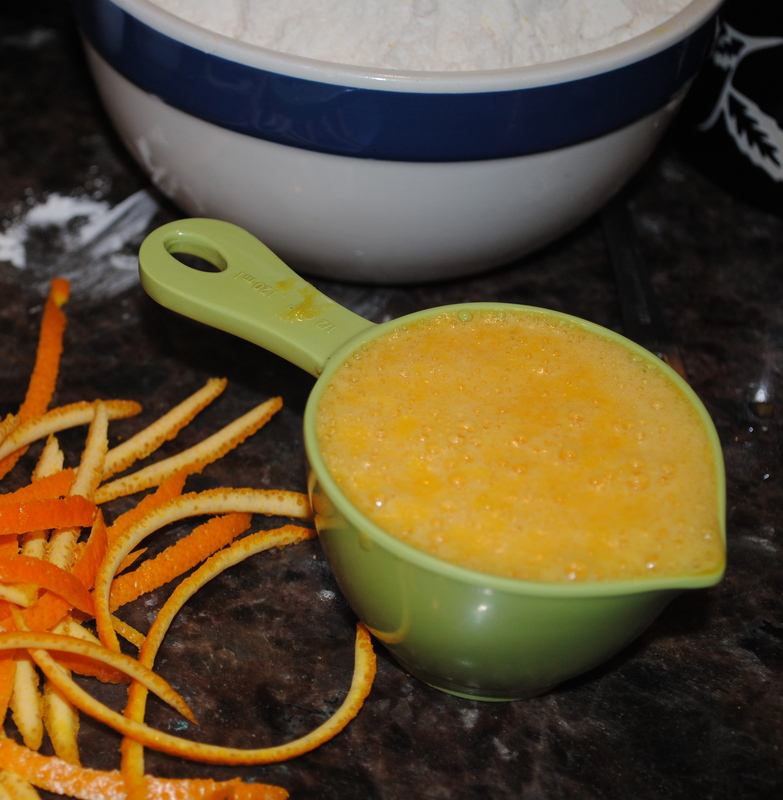 Peel oranges (removing any seeds and as much of the white pith as possible) and puree in a blender or food processor. Measure out 1/2 cup of the liquid pulp. 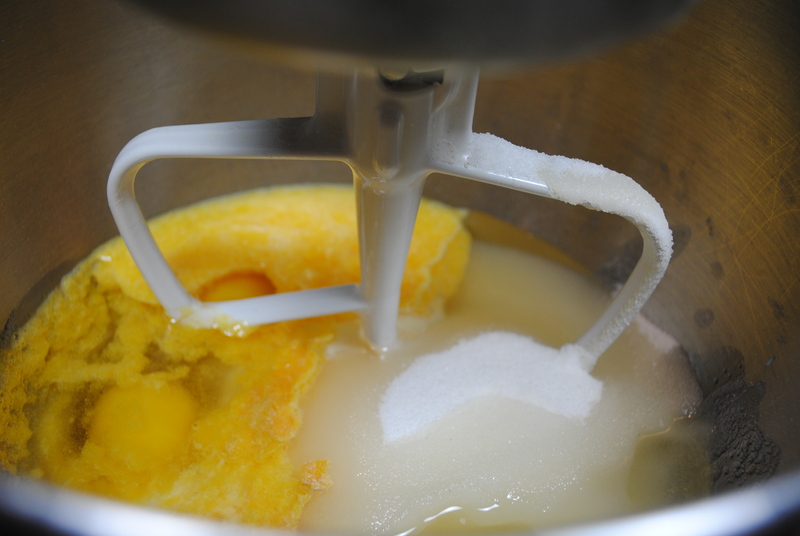 In the bowl of an electric mixer, combine orange pulp, eggs, buttermilk, vanilla, orange extract, sugar, and vegetable oil. 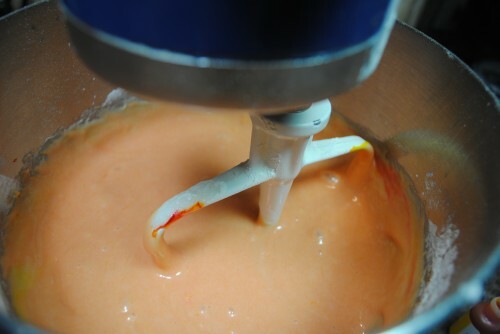 With the mixer on low, gradually add in the flour mixture, beating until just incorporated. 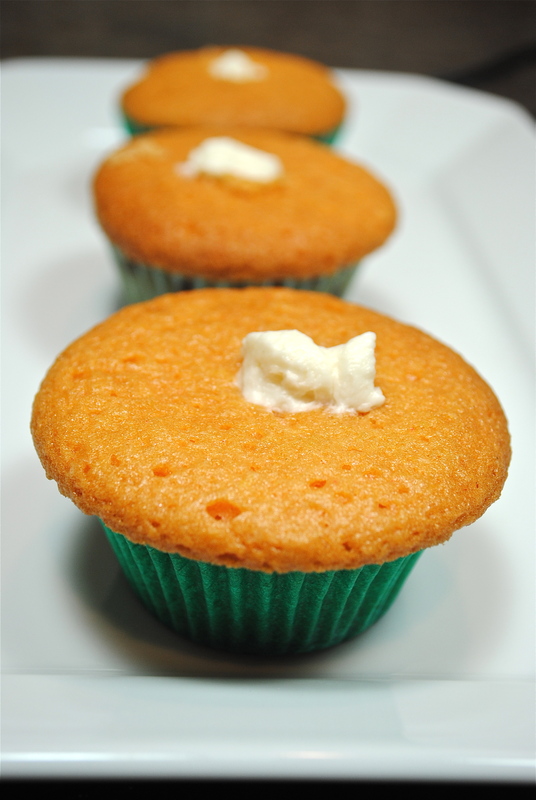 Fill your cupcake containers of choice a scant 2/3 full and bake 20-25 minutes, or until a toothpick inserted into the center comes out clean. 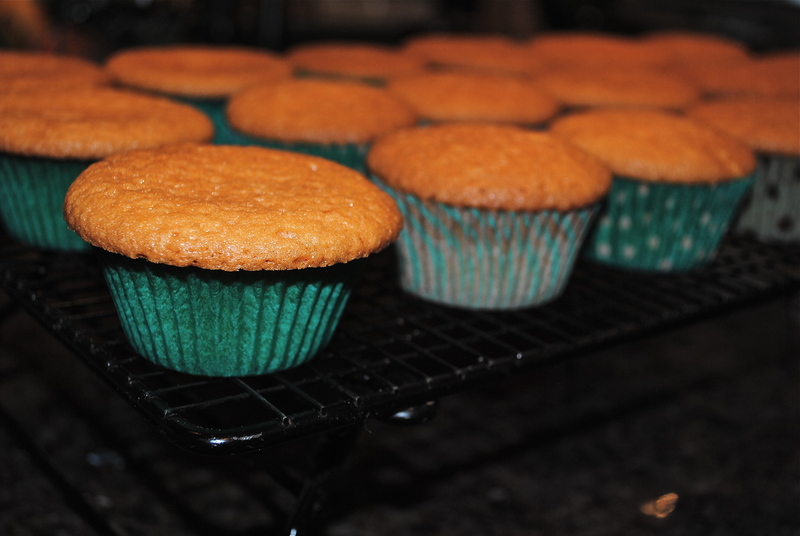 Transfer cupcakes to a wire rack to cool completely before filling, frosting, or garnishing as desired. In the bowl of an electric mixer, beat the butter at medium-high speed until creamy. Add half of the sifted sugar, the vanilla, the orange extract, and the orange juice. Beat until combined. Gradually add the remaining sugar until the frosting reaches your desired consistency. 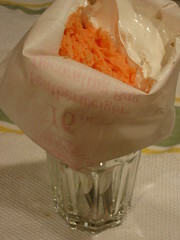 Place your decorating bag, tip down, in a glass and fold the top of the bag over the rim of the glass. 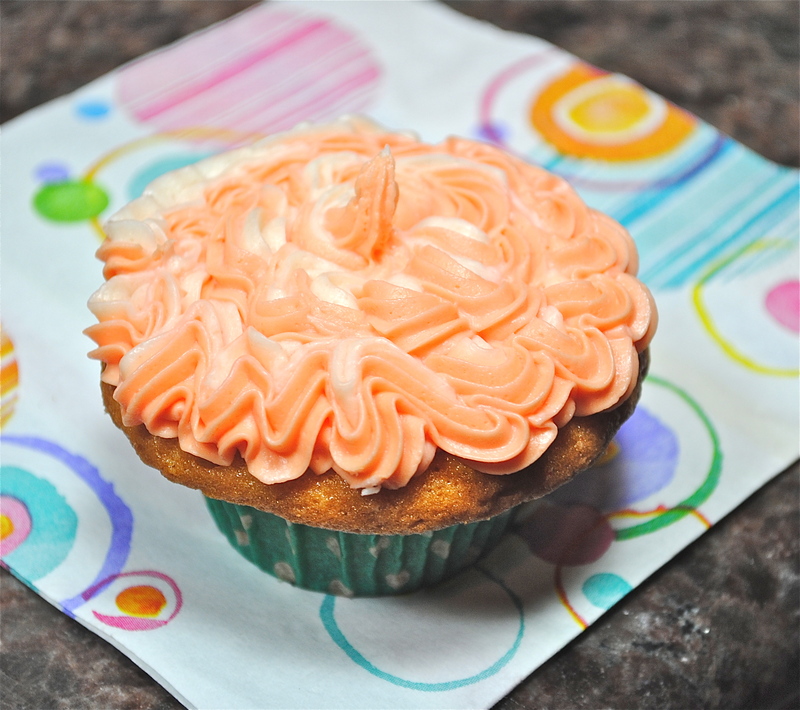 Using long teaspoons, alternate adding each color of frosting to the bag. Though it takes longer, the best results are achieved when you add only small amounts of each color at a time. You’ll need to sort of press the frosting up against the side of the bag as you go; it will naturally fall toward the center a bit. 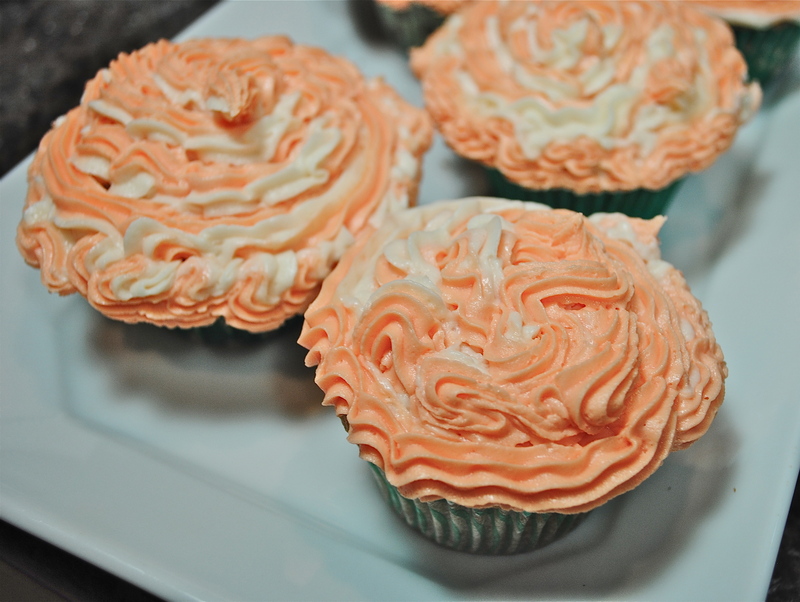 I went to the Williams-Sonoma Sunday class when you made whipped cream frosting. My childhood piano teacher gave us this recipe in the mid-60s. She was from Kentucky (or maybe Indiana). Her name was Mrs. Pulos, so we always called it “Mrs. Pulos’ Frosting.” We made it for years. I had lost the recipe, so I was glad when you shared it with the class. Thanks for all of the great tips and recipes from the classes and on your blog.